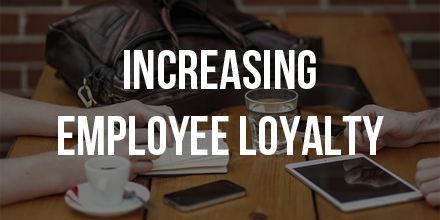 Understand what employee loyalty means. Employee loyalty is an umbrella term for emotions that make employees feel attached to their current employer and are less likely to search for other opportunities elsewhere. When striving to increase employee loyalty, it is key to increase the positive emotions and decrease the negative emotions that employees feel while apart of the organization. Offer competitive and fair compensation. A large aspect of employee loyalty is compensation. Employees expect to be paid as much as they could earn doing the same job somewhere else. If they do no receive this amount they will feel de-valued and are far more likely to search for employment elsewhere. Employees also expect to be paid as much as their peers who are doing the same work. A simple way to establish competitive fairness is to publish everyone’s compensation. Hire more referrals. One easy way to ensure a connection between employees and the company is to create a referral bonus and have an employee referral program. This provides a way for employees to recommend their friends and results in a lower employee turnover rate. Give employees more control. Employees who feel that they have more control and who are truly engaged in their work are more likely to remain loyal to their current company. Companies that have employees who are making decisions rather than simply following orders have a 31% lower turnover rate. Remove unnecessary uncertainty. Today’s workplace contains more uncertainties than in the past. This is often a result of the economic changes that constantly disrupt stable markets. In order to alleviate stress over these uncertainties, it is important to strive to make work more predictable. This can be done by simply keeping employees briefed as well as giving them advance warning when changes are approaching. Millenium Staffing Solutions is a wonderful agency to work with. They truly understand our constant changing needs and always put the effort into sending the ‘right’ person.